The Maple View North Mennonite congregation is part of the Markham-Waterloo Mennonite Conference which was formed in the late 1930s. The first members of Maple View came from the surrounding congregations of Montrose, North Woolwich and Goshen . Primarily due to the cheaper, readily available farms north of Waterloo Region, more members kept moving into this area. In 1975 the conference purchased land for the Maple View and Fair Haven meetinghouses to better serve these outlaying areas, and to relieve the pressure on the other meetinghouses. However, it was not until 1982 that construction commenced at Maple View. By then the local community included 28 families—sufficient to begin a congregation. On 8 May 1982 excavation for the meetinghouse's footings began. 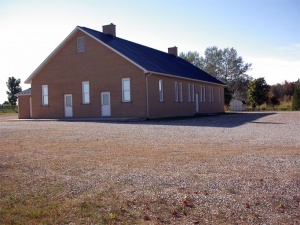 Volunteers from within the Markham-Waterloo Conference did most of the construction—typical for the meetinghouses and private elementary schools operated by the Conference. A committee selected from each congregation in the area oversaw the project. The majority of members are livestock farmers, so this was a very busy time. The building design is simple both inside and outside—there is no electricity, running water, flush toilets or telephone—in keeping with other meetinghouses in the conference. There is a yellow-brown brick exterior with hardwood flooring inside. The pulpit is centered on the long side with rows of wooden benches to its right and left facing the center. The middle area has benches facing the pulpit. Men are on seated on the right side facing the pulpit and women on the left, as is the traditional fashion. The building was completed in time for dedication services on 4 July 1982. Services were usually held every two weeks through 1998. The Maple View North and South congregations came into being in January 1999. The Maple View meetinghouse was then near capacity so two congregations were formed in the one meetinghouse. Thus the building has been used every Sunday since. Wellington County Road 7 became the dividing line between the North and South congregations. Minister Emerson Bauman remained with the North group. Although another minister was ordained in November 2000, Bauman continued to assist in 2003. A farm accident in 1993 left one member paralyzed, resulting in necessary modifications to the building to make it more wheelchair accessible. Two families in the congregation have deaf children; signing has been provided for them since January 1989. English has been the language of worship since about 1975; however some German hymns were still sung until 1996. This too was discontinued because the younger folks did not understand the words, though Pennsylvania Dutch is still spoken in many homes. Weber, Steven. "Maple View North Mennonite Meetinghouse (Alma, Ontario, Canada)." Global Anabaptist Mennonite Encyclopedia Online. November 2003. Web. 24 Apr 2019. http://gameo.org/index.php?title=Maple_View_North_Mennonite_Meetinghouse_(Alma,_Ontario,_Canada)&oldid=115546. Weber, Steven. (November 2003). Maple View North Mennonite Meetinghouse (Alma, Ontario, Canada). Global Anabaptist Mennonite Encyclopedia Online. Retrieved 24 April 2019, from http://gameo.org/index.php?title=Maple_View_North_Mennonite_Meetinghouse_(Alma,_Ontario,_Canada)&oldid=115546. This page was last modified on 13 March 2014, at 14:26.